HISTORY - Kaneko Kohyo Pottery Manufacturing Co.,Ltd. Kaneko Kohyo ceramics was founded in 1921, when Ito Kohyo chose the site for the original kilns at the top of a small mountain near Toki City, Gifu Prefecture. The Toki area had been long famed for its fine casting methods making various items for shrines and family alters. In the early years, the company produced mostly Buddhist effigies. 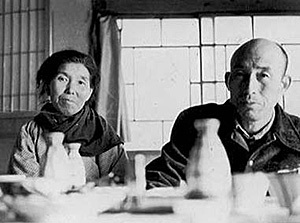 After the war, Ito Kohyo’s son, Terumi, took over the family business, and as Japan’s economy expanded, he too expanded the lines of new products that required fine casting. 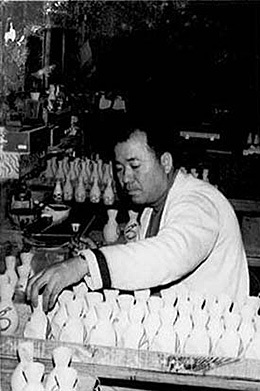 He realized that pubs, bars and restaurants required tokkuri sake pouring bottles for the serving of hot sake, and soon orders for the quality items flooded in, with orders peaking in the early 70’s at around 130,000 pieces per month, or an annual average of 1.6 million pieces. At the time, Nagasaki’s Hasami kiln was recognized as the nation’s top tokkuri maker, however, the Kohyo kiln soon surpassed its production figures to become the world’s top producer of tokkuri. 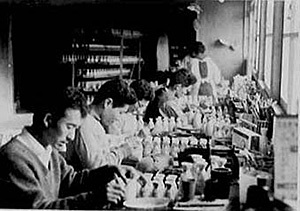 In the early 70’s, production of tokkuri sake serving bottles reached its peak, when 130,000 flasks were produced monthly, or an annual production volume of 1.6 million. The Toki area had been producing pottery from ancient times, and quality pinewood to fire the kilns was becoming difficult to obtain. Thermally efficient coal and oil burning kilns began to be developed, and the hillside kilns of the local area began to disappear. 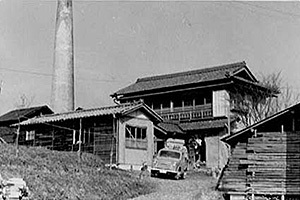 Kohyo too made the change from using a hillside rising kiln to a coal-fired kiln in 1966, and from 1970 an oil fired tunnel kiln. This kiln produced the world’s greatest output of tokkuri. Often, tokkuri were used for promotional purposes, with the names of the brewer, or the bars, restaurants or inns where the sake was served, featured on the bottles themselves. There were said to have been around 3,000 sake brewers nationwide at the time, and Kohyo’s kilns produced the special logo featured promotional tokkuri bottles for around 1,000 of them. Certain technology was required to produce these promotional tokkuri bottles. Each of the various tokkuri designs were expected to hold a standard capacity of sake. Not just the designs, but the fact that the ceramics themselves shrink about 10% after firing had to be taken into consideration. Shrinkage rates varied depending on the layers of mined clay, and so close attention was required during molding and manufacturing, and this led to improved technology. As the tokkuri were formed in gypsum molds, ways of reducing the gypsum were developed, too. As our skills and technology improved, our name became synonymous with quality tokkuri. With changes in Japanese consumer’s drinking habits, orders for tokkuri began rapidly decreasing around 1993. Over the years, orders for the vessels dropped to below 2,000 pieces per month around 2009. To counter the downward trend and prevent the company from collapse, from around 1995, production of tableware and kitchen items commenced. Today the company challenges itself with the cultivation of new vacuum kiln firing technology and methods, as well as production of new items meeting the needs of a wider range of customers. Please make any inquiries regardingKaneko Kohyo Pottery Manufacturing Co.,Ltd. products here.